When we were in Traverse City for Matt and Bridget’s wedding, Judy had the most delicious strawberry jam out. She said it was “freezer jam” and so incredibly easy to make, just follow the directions on the box. I decided I would give it a try…I was a little skeptical though, because Judy is an amazing home baker/canner/you name it! 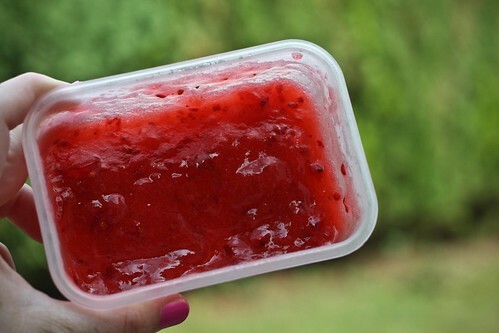 I bought a package of Sure-Jell Certo Fruit Pectin, followed the directions…and what do you know…amazing jam!!!! I didn’t get a chance to buy berries today, but I DO have some frozen blueberries that I got a few weeks ago fresh. You seriously do the coolest stuff, kiddo. Fantastic idea! Can’t wait to get some of the fresh berries from Terry’s Berry’s in WA and try this out. This is a great tip. 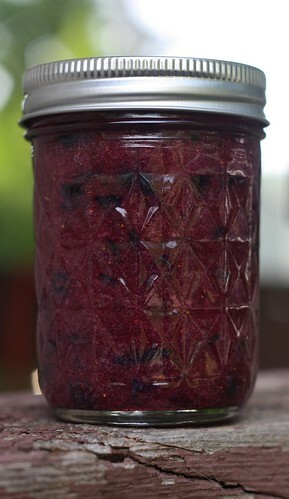 I’ve been intimidated to make my own jam, but this post has given me confidence just in time for farmer’s market season. Ordering a 4-pack of pectin on Amazon…now.